Geoffrey Burleson performs "Powerhouse Passacaglia," a "Fantasy-Homage on Raymond Scott's 'Powerhouse'," composed by Burleson, at the New West Electronic Arts & Music Organization Festival, at Brooklyn’s ShapeShifter Lab, December 7, 2015. The Berlin-based trio Oui d'Accord present an original arrangement of Raymond Scott's "Powerhouse" for guitar, bass and accordion. Filmed in Super 8! Unless the guys wrote it down, no sheet music exists for this instrumental configuration. We now offer Part 2 of Takashi's video, which you'll find was worth waiting for. I wanted to take a moment to express something — in the mid-1990s you gave me a Raymond Scott CD (Reckless Nights and Turkish Twilights) when my son and daughter were babies. Now they are grown up. 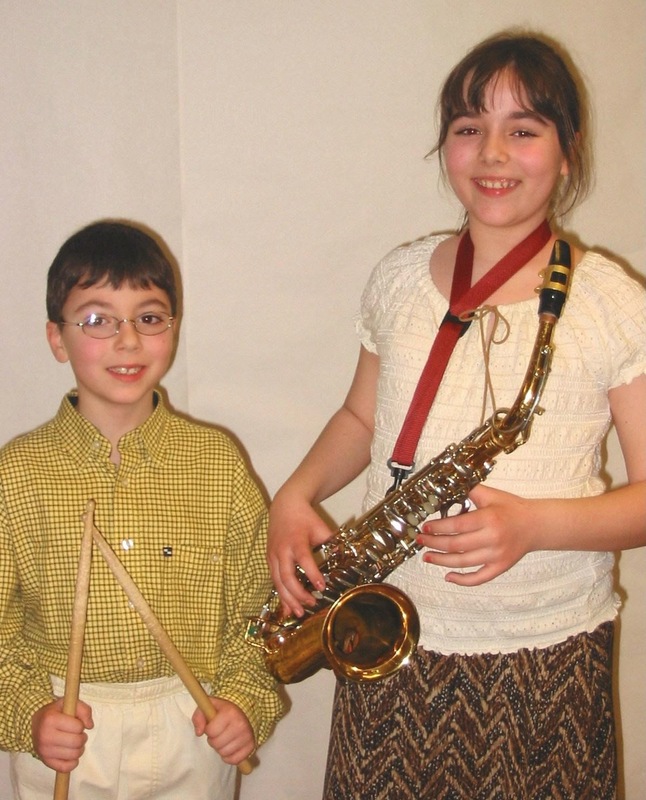 Nicole plays sax, and Nicholas plays French horn, drums, cello, and anything else he touches. Nicholas (who also plays drums with my band) recently hopped in the car when I picked him up from work, opened the console, and immediately inserted the Raymond Scott CD into the player. He listened to his favorites since childhood: "Manhattan Minuet," "Tobacco Auctioneer," and "At an Arabian House Party." He can point out where the clarinet squeaks in "Powerhouse" and how the trombones are intentionally dissonant in "House Party." My daughter Nicole does the same thing with the same CD, and she said it has struck her since early childhood that music could ever sound like that. This is a roundabout way of saying thanks for playing such an indirect yet profound influence on their musical development. Raymond Scott's music is such a treasured part of our lives. 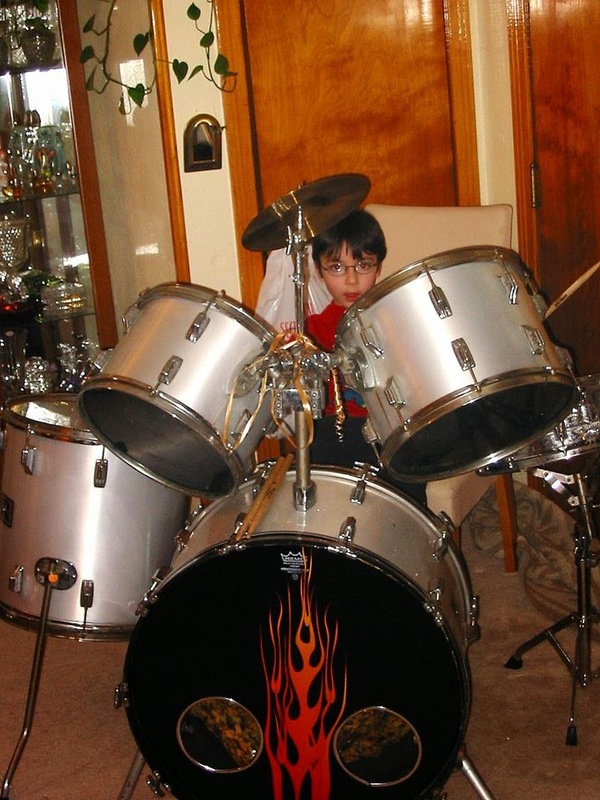 Nicholas (above) had been listening to Raymond Scott since age 3 and wanted to play drums. Being a musician mom, well, it was no holds barred. 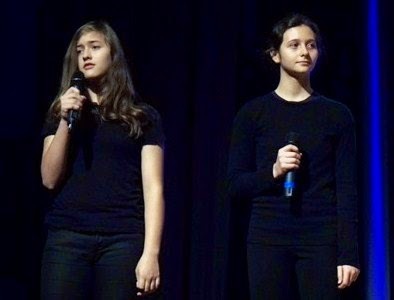 Ages 8 and 10 (above) they performed together playing "Jingle Bells" in the school talent show. She doesn't play sax so much now, but fronts an all-original punk group and writes their lyrics. 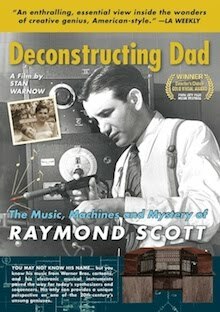 I wish there were a way to expose more young children to intricate music like Raymond Scott's. I did so experimentally, but what an amazing outcome. Our friend and fellow Scott scholar Takashi Okada, of Tokyo, has produced a 3-1/2-minute video showcasing THE RAYMOND SCOTT SONGBOOK, which he produced in cooperation with the Scott estate. This is part 1 of a 2-part series; part 2 next week. 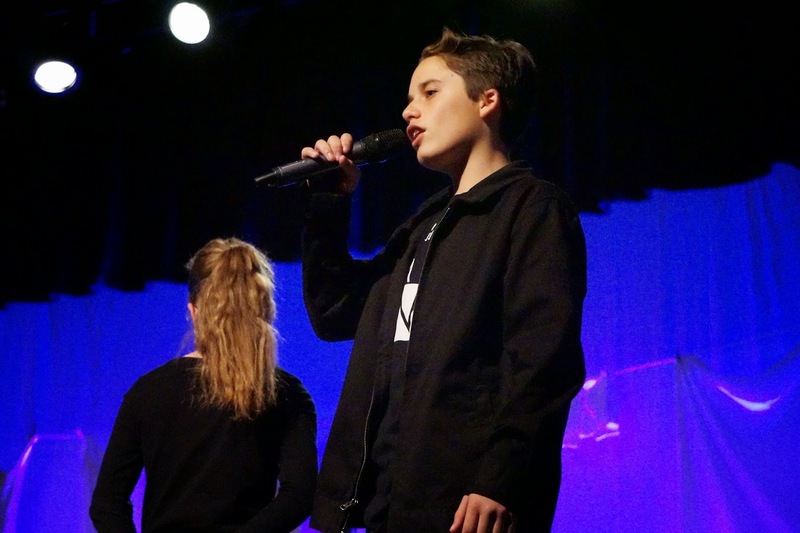 Tess, Zack H. and fellow poets perform "The White Clothesline"
Take 100 middle school students and a lesson on poetry and art that embraces light and shadow. Add careful observation, thoughtful discussion, and provide an environment where these students can sketch, paint, write and share. What do you get? A poem called “The White Clothesline,” performed before an audience, with intro music from Raymond Scott Rewired. This mix of words, images and music holds a special meaning for me because Raymond Scott was my father. Much has been written about Raymond Scott as an unswerving taskmaster, working his musicians relentlessly in pursuit of a lofty standard of perfection. His method of teaching me to play the piano as a young child—practicing endless scales—was anything but fun. But my father also had a playful side, as well as a passion for combining and recombining sounds, styles, and genres. That was fun! It was fun for him, and for those who shared his vision. I must have inherited his fascination with combining art forms and modalities. I’m the third of Raymond Scott’s four children; I am also a writer who teaches poetry at the Willows Community School in Los Angeles. On February 12, ten of my talented students performed a piece that embodied creative confluence—a process dear to my father’s heart. Confluence: a place where people or things come together. Confluence came to work with me over the past few weeks: Blending art with poetry. Connecting fragments written by 100 students into an ancient poetic form known as the “cento.” Weaving 6th and 7th graders’ voices and perspectives. Bringing ten of those students onstage to speak the truths hidden within a white towel, a pair of white ski pants, and a tiny white sweater. Finally, adding a musical introduction that was a mash-up in itself! When I searched my music library for an intro cue, I wasn’t looking specifically for a Raymond Scott composition. In fact, I brought in three selections to play for my kids. But when I put on “Good Duquesne Air” (audio below)—one of my favorite tunes from the fascinating Raymond Scott Rewired project—we had an immediate groove going on. “That’s so cool!” “What is that?” “Who is that?” I explained that it was my father’s music, reimagined by mixmaster Mark Vidler (of Go Home Productions). On Poetry Night, the vintage and modern elements of “Good Duquesne Air” gave the audience a mysterious feel for what was yet to come. In a confluence, streams flow and merge together from various sources. Fusing art with poetry opened up wider vistas for our students. Distilling the writings of many young poets into a cento told a new story. And incorporating even a taste of my father's musical legacy into “The White Clothesline” reminded me that a creative confluence is a gift big enough to share. Raymond Scott music travels at various velocities. It can be delivered on LPs that spin at 33-1/3 revolutions per minute. 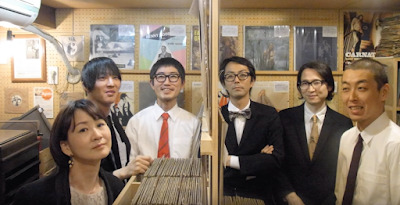 There are a handful of rare 45 rpm singles. His electronic music was captured on tape that rolled at 3-3/4, 7-1/2, or 15 inches per second. The rotational speed of a Basta compact disc of Scott's Soothing Sounds for Baby varies from 210 rpm (outer edge) to 480 (inner edge). But Scott's music first came to prominence on fragile platters that whirled at 78 rpm. 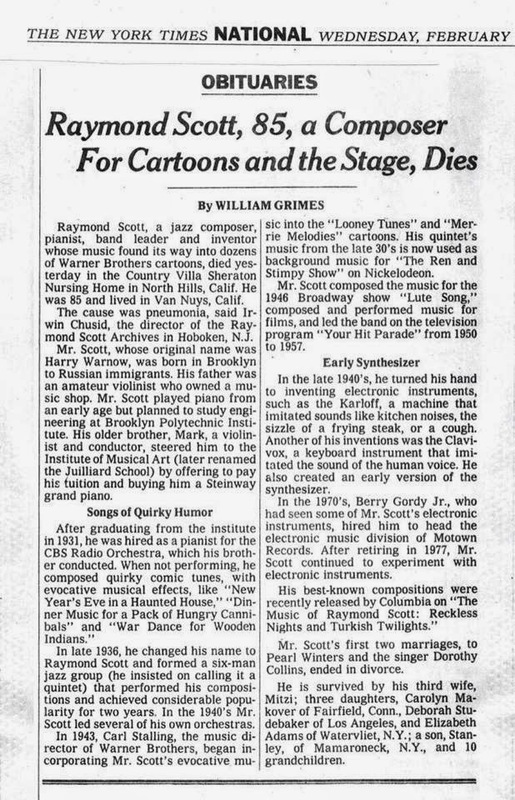 It is therefore fitting that 78 years ago today, Raymond Scott entered a New York studio with his legendary Quintette to record his first commercial sides. It was a productive day. While no one knows how long the February 20, 1937 session lasted, by the time Scott and his cohorts mopped their brows and went home, they had recorded two timeless classics — "Minuet in Jazz" and "Twilight in Turkey" — and two immortal works — "The Toy Trumpet" and "Powerhouse." Not only were these four recordings all approved for commercial release, they are inarguably the definitive versions of all four works. How long did it take Brian Wilson to complete Smile? Is it done yet? Al Brackman, an associate producer for the Master label, which signed the RSQ, told historian Michèle Wood: "Our studio at 1776 Broadway was basically just an office with a seven- or eight-foot ceiling. There was a long hall leading to it from the elevators. Opposite the office door, there was a men's room lined with tiles. Scott insisted on recording at night so he could put one mike in the hall and another in the men's room. With that and the other mikes in the office he achieved what they call 'echo' and gave the recordings a big auditorium sound." 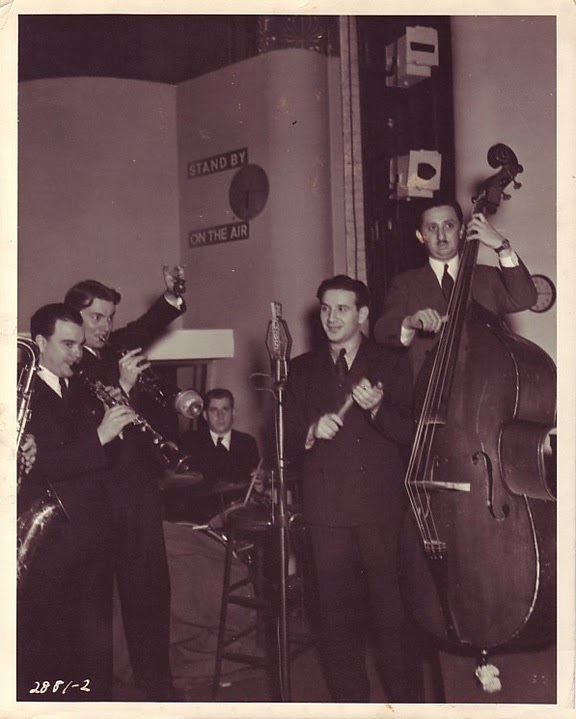 We don't have any photos of that makeshift Broadway chamber, but we have lots of photos of the RSQ during radio gigs (see above—saxophonist Dave Harris was cropped out by the cameraman). The first RSQ release was "Twilight in Turkey," backed by "Minuet in Jazz." The disc sold out within a week. "It had nothing to compete with it," said Brackman. "If you liked Scott, you had to buy Scott." 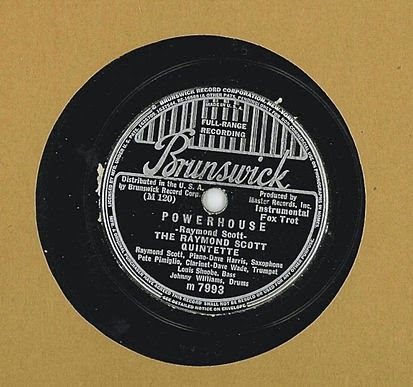 Fans first bought "Powerhouse" on the Master label, which went bankrupt in late 1937. 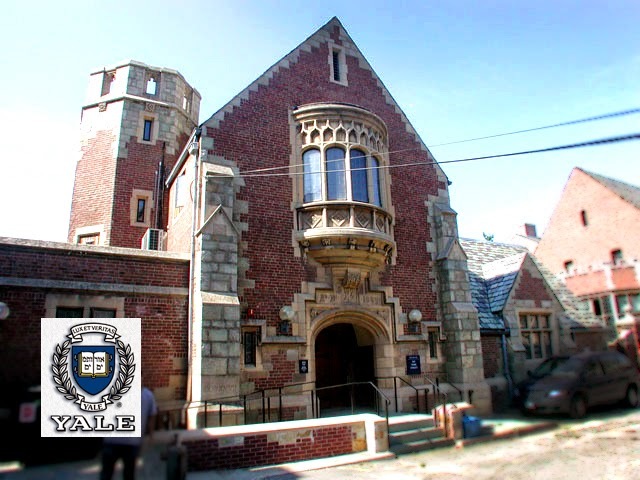 The track was reissued on Brunswick in 1938, and in 1939 on Columbia. Same recording each time. Note: I won't reveal the name of the "unknown" bandleader/composer, but I didn't discover him. His work was discovered by our friend Takashi Okada of Tokyo, who passed the recordings along to me, and I sent them on to Brian certain that he would appreciate them. It was Brian's idea to arrange and perform them. Here's GTO's recording of Scott's "New Year's Eve in a Haunted House." 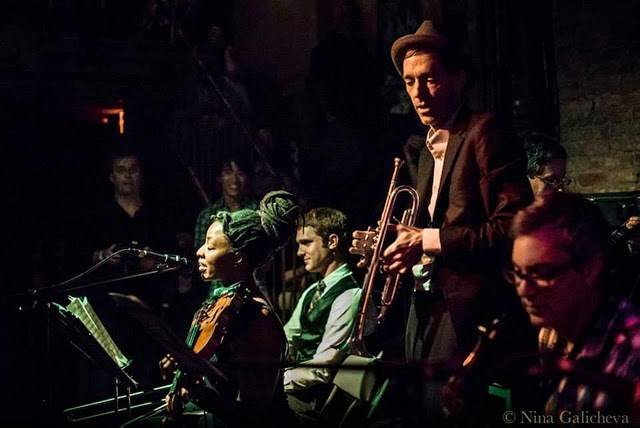 Violinist Jeremy Cohen, leader of Quartet San Francisco, has been a longtime champion of Raymond Scott and recorded a number of Scott tunes arranged for string quartet on the QSF album Whirled Music. 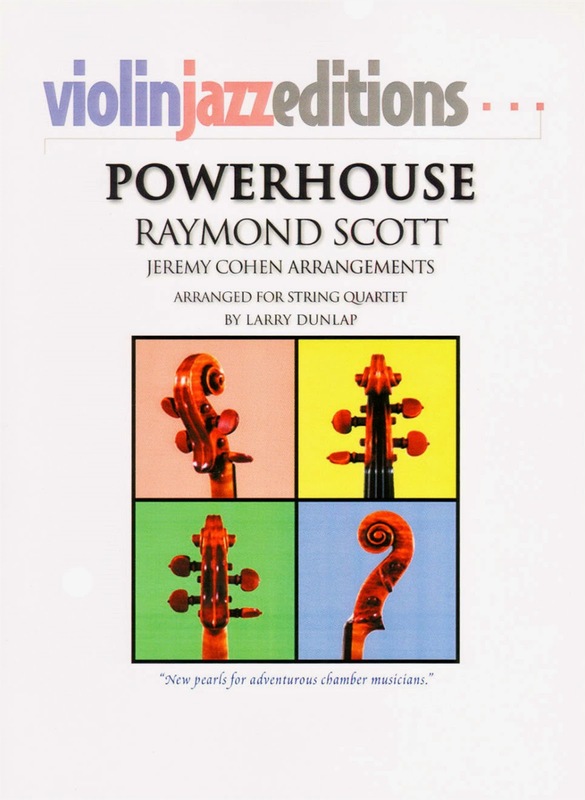 Cohen has made the string arrangement for Scott's "Powerhouse" available through his ViolinJazz Editions series ("New pearls for adventurous chamber musicians"). Scott's early Quintette works have occasionally been referred to as "chamber jazz," so it's fitting that they be arranged for and performed by chamber ensembles. The Kronos Quartet recorded an arrangement of Scott's "Dinner Music for a Pack of Hungry Cannibals" on their album Released 1985-1995. Kronos have also performed Scott's "Powerhouse," "The Penguin," and "Twilight In Turkey," but they haven't recorded these titles nor have they published the arrangements. 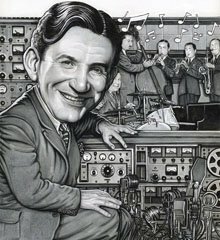 Raymond Scott passed away 21 years ago today, at the age of 85. 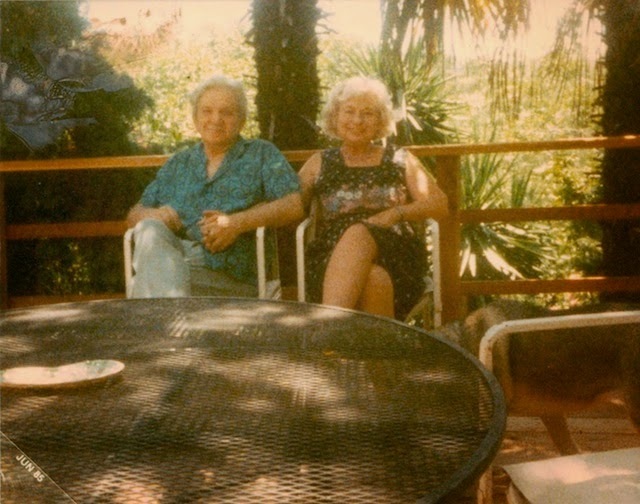 His death was not unexpected—he had been stroke-ridden since 1987, and his wife Mitzi had struggled for years as his caretaker at their home in Van Nuys. The above photo was taken in 1985, when Raymond was 76 or 77; he had already suffered a series of heart attacks and had not worked professionally in almost a decade. If I recall correctly, at some point in late 1993 or early '94 Raymond was admitted to a nursing home in North Hills, where he suffered a fall, broke his hip, and eventually contracted a fatal bout of pneumonia. I was notified by Mitzi, and promised to get word to the press. Memories are vivid, because 1994 was a brutal winter in the northeast; in early February I was largely housebound due to extraordinary accumulations of snow and ghastly banks of ice around town. The internet had not yet become a medium of instantaneous communication—no Facebook, no Twitter, no Instagram, no blogs. I didn't even have an email (huh?) account. There were only two options for getting the news out: telephone and fax. I spent the entire day calling, informing, leaving messages, fielding incoming calls, writing obit drafts, and faxing. 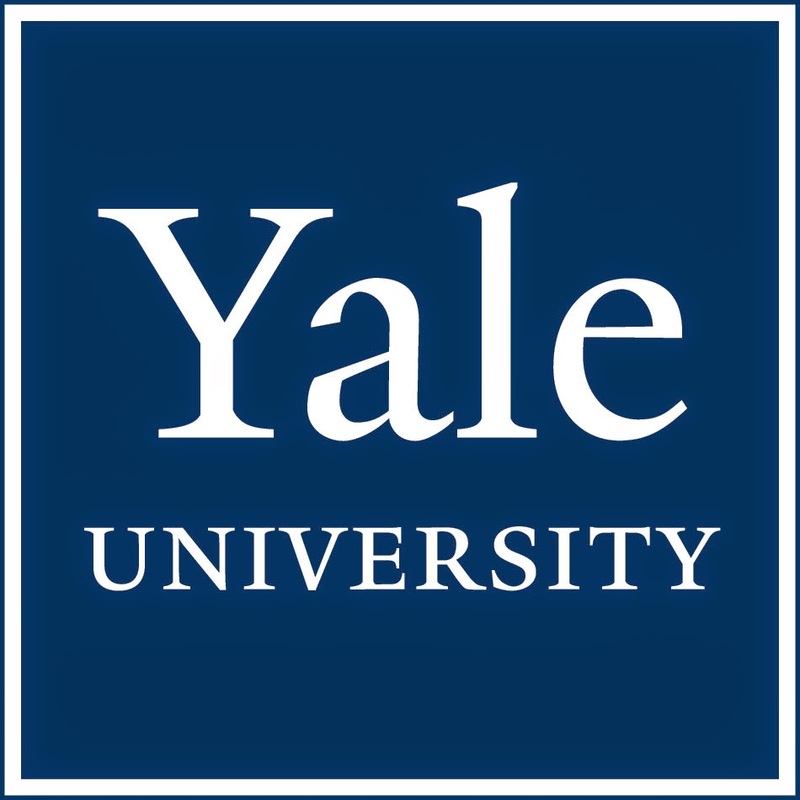 Coverage was extensive: the New York Times (reproduced below); Los Angeles Times; Billboard; Variety; and the wire services. Despite my best attempts to present facts to the media, one erroneous claim made it into many stories, and that untruth remains in circulation to this day. 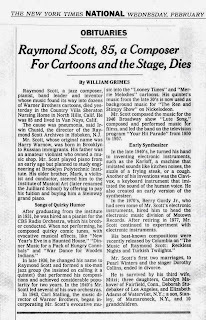 It is plainly evidenced in the NYT headline: "a Composer for Cartoons."